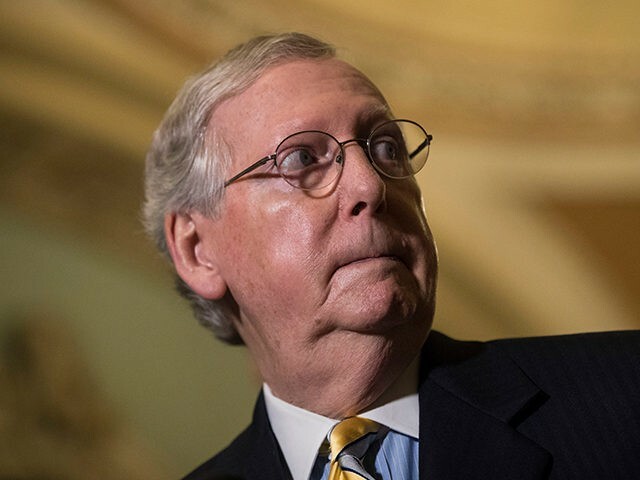 Senate Majority Leader Mitch McConnell (R-KY) said on Tuesday that to complete unfinished business, lawmakers will not take an August recess. That business includes addressing President Donald Trump’s hundreds of unconfirmed nominees and passing a budget by September 30, the end of the fiscal year. I'm glad the Majority Leader agrees, in order to drain the swamp we need to keep the pump running in August. We need to take this time to work and get results for the American people. As Breitbart News reported, conservative senators sent a letter to McConnell about work that needed to be done before the end of the fiscal year. “At this pace, it is unlikely the president will have all of his nominees confirmed before the end of his term,” the letter said. • It’s more painful for Dems. They have at least 5 seriously vulnerable incumbents on the ballot; Republicans have just one (Heller). • This is basically a threat to Schumer: if Dems submit to a package of nominations, recess could return. The senators’ #MakeCongressWorkAgain campaign is supported by conservative groups, including the Tea Party Patriots and the Conservative Partnership Institute, which posted about Congress’s short work week and lack of productivity on its Facebook page. Sen. Perdue; Jenny Beth Martin, co-founder of Tea Party Patriots; Marc Short; White House director of legislative affairs and former Sen. Jim DeMint (R-SC), who now works with CPI, held a press conference on May 11 to announce the campaign, as Breitbart News reported. “And if Congress hasn’t confirmed President Trump’s nominees by the end of July, they should cancel the August recess,” Martin said. Ahead of Memorial Day weekend, Breitbart News reported the Senate and House websites reveal both chambers adjourned on Thursday afternoon, held a “pro forma” on Friday (a parliamentary law that allows a short session in which no voting or business is taken up, yet lawmakers are protected for violating the no-more-than-three-days-off rule) ahead of the Memorial Day weekend. Both chambers held another pro forma session following Memorial Day and, after working on May 30 and 31, followed the same schedule until returning full-time on Monday. That means Congress only worked for two days over that period. Perdue said the same campaign last year resulted in the confirmation of 77 of Trump’s nominees ahead of the August recess.